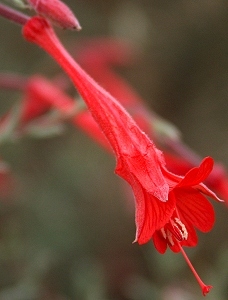 Gray California Fuchsia (formerly Zauschneria cana) is a gorgeous, reliable, easy care, drought tolerant late summer/early fall blooming plant with profuse bright orange-red flowers. Its soft gray foliage and 1-2 inch long flowers are light and airy and move gracefully with the breeze. Gray California Fuchsia is a very important fall blooming plant, not only for the much needed boost of color, but also for the nectar rich flower tubes that feed the hummingbirds. In fact, this plant is sometimes called Hummingbird Trumpet because its narrow flower is just the right shape for their tiny little tongues to lap up sweet nectar. Since hummingbirds average 1000 flowers a day, it is fortunate that this shape keeps out a lot of competing insects. The plant above is actually one plant that has spread to cover 20 feet or more over about 10 years. This photo shows the new spring growth that emerges from the ground in late March here in zone 8. We cut our plants back to the ground each fall. 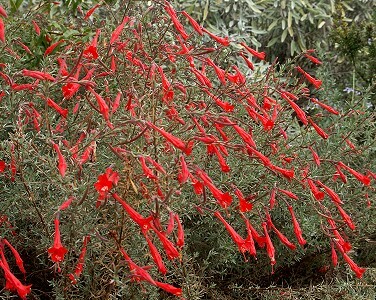 Once established Gray California Fuchsia can take quite a bit of drought but looks better with regular watering. For more information on fall blooming plants, be sure to check out our newsletter Fall's Fabulous Follies. This plant is sometimes available in plug trays. These trays hold 128 of all the same plant. They are a great low cost way to fill a lot of space. Each cell is 3/4 of inch by an inch. 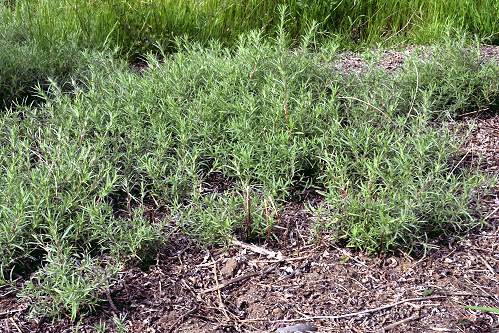 Check here to see if Gray California Fuchsia Plug Trays are available.